This weekend a news item on NPR noted that thousands of people formed a human chain around Japan’s Parliament complex to demand that their government abandon nuclear power. 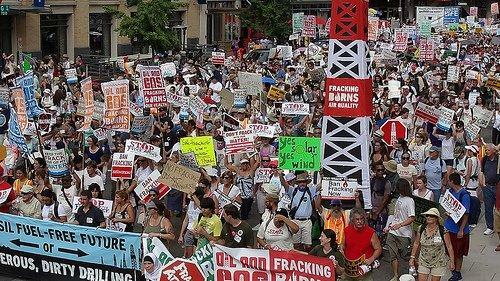 But you’d be hard-pressed to find media coverage about the 5,000 people who came from across the country and around the world to demand that Congress stop hydrofracking. Granted, 5,000 people is a “drop in the bucket” according to Washington DC standards. Still – with all the mainstream press taking photos and interviewing folks, you’d think at least one story might have surfaced in the local news. Washington Post? Nada – unless you count the hundred-word or so blurb from AP about the protest “going to happen”. The NY Times? Not one peep; the gray lady was probably getting her hair dyed. People drove, bussed, flew, bicycled and hitchhiked to DC a couple days early to lobby their elected officials (hey! The Oil & Gas folks do it all the time…. But with more cash changing hands). 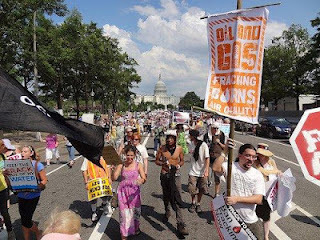 Saturday was devoted to a rally on the west lawn of the US Capitol, with Bill McKibben, Josh Fox, Dish TX mayor Calvin Tillman, and just regular folks living in gasland states sharing the microphone. When that was finished, people marched through the streets of DC - a parade four blocks long of men, women, teachers, artists, carpenters, grandparents, children... all chanting for clean water and a ban on fracking. Read more here. like those thousands of others, I was unable to go myself. But I watched a bit of streaming video and read dispatches from the front. and like you, I am grateful that there were 5000 people who were able to be there. No fracking. Neither in the U.S. nor anywhere else on the planet. Fracking was banned in France and in Bulgaria (this battle is not over because oil and gas companies want to circumvent the law) => let's fight for a global ban of fracking. No Fracking. Neither in the U.S. nor anywhere else in the world. After getting a ban in France and Bulgaria (and even if this battle is not over because the oil and gas companies want to circumvent the law), let's fight together to get a worldwide ban of fracking and shale gas and shale oil extractions. (In France a huge mobilization is already planned in South of France). I was one of many who went. Mayor Tillman and I attempted to talk to Rep Michael Burgess, but he was out and not one member of his staff would give us the time of day.